Quasimodo are proudly flying the flag of gothic rock for Yorkshire. The Leeds based super-trio made up of Joel Heyes (Action Directe/I Demand Satisfaction/Mikoyan) on guitars and vocals, Daevid Frampton (Rome Burns) on guitar, and Emma Hedley (Dawn of Elysium/ex-Action Directe) on bass have already built up a solid live presence on the back of their debut EP, 'Liberty, Equality, Atrocity', released last year. The EP showcased a raw and witty blend of gothic rock and post punk that was refreshingly up-front and honest in its style. 2014 has already seen a new follow-up single released in the form of 'Under The Whip'. 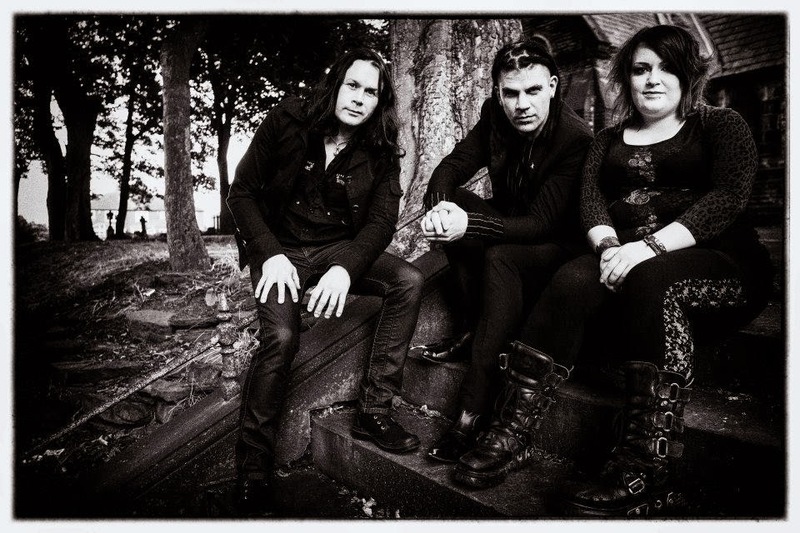 So we thought it was time to catch up with the band to talk about the state of gothic rock and moving on from their previous projects. Intravenous Magazine: You've just released your new single 'Under The Whip', how has the reaction been to that so far? Joel Heyes: It's been very good – I think the single is a slightly less perverse proposition than the EP was (excuse the pun) so people understood it straight away. But things are so diverse now in terms of media in the alternative scenes that it's very hard to tell! IVM: The new single was produced by Zeitgeist Zero. How did that come about? JH: We realised that the self-production on the EP wasn’t really cutting it, so the idea of getting an external producer was very appealing. I was always a fan of the production on the Zeitgeist Zero stuff so I took a chance on whether they would throw us a bone, which they very graciously did! Personally speaking I hadn't worked with a producer for years so it was a great help to have that support during the process – plus they are old chums of ours so it was great fun to do. The result sounds about 30 years more current than the EP did. IVM: You released the first EP 'Liberty, Equality, Atrocity' last year. How do you feel that was received and are you happy with it as a finished product? JH: In terms of the quality of performance and songs it was a very satisfying piece of work, although the compromise had to be on producing something quickly and cheaply so I'm far from happy with the production. It's too murky (even for a goth record!) but then again I have no one to blame but myself for that. The reception was great though, it was very refreshing to have a view of something I was involved in that wasn't based on fifteen years of misconceptions. IVM: So far you've self-released your music. Is this a model you intend to keep or would you be open to offers from labels? JH: Is there another option? If someone wanting to wave a cheque under our noses and offer to keep us in snakebite & black for a few years then we would not be adverse to that. But the industry doesn't work like that anymore, so you have to be pro-active or perish. As in life! IVM: You've previously seen action as members of Action Directe and Rome Burns. How did you all come together to form Quasimodo? Daevid Frampton: Joel collared me at one of the Flock events a couple years ago. Having recently moved to Leeds and still being with Rome Burns at the time (the first and only band I had been in up to that point) I was interested in trying something a little different and seeing how far we could go with a new band. Of the three projects Joel had started I think this the only one surviving which must say something. JH: I knew David through a mutual friend of ours, and I was starting to do most of my work outside Action Directe at the time so was looking to form a goth band, basically. Emma was playing bass in AD at the time and I'd already asked her to come on board so I chanced my arm that David wouldn't find the idea utterly implausible. And we're still here! IVM: How did you come settle on the moniker of Quasimodo and how do you feel it represents the band? JH: It just struck me as a relatively neutral, understated name that hinted at 'der goffick' while also having a bit of dark humour in there too. Plus I couldn't think of anything else at the time. IVM: The band's sound is raw and very proto-gothic with overtly punk elements to it. How did you arrive at this – was it organic or more structured? DF: I think that has a lot to do with our backgrounds and musical preferences as it is to do with the technology we are using on stage. Whilst it is nice to have swathes of multi-layer instrumentation I think it can be too much of a distraction taking us away from the fact we are a three piece guitar based band. It is refreshing to come back to basics with less in the way of distractions. JH: Personally I was at the stage where I wanted to play & sing songs and play lots of noisy, post-punk guitar. So being able to do that in Quasimodo was fantastic – we have drum tracks and a few keyboard incidentals but everything else is the three of us, so live it can get wonderfully noisy. We're keeping it old school! IVM: One thing that stands out about the band is the sharp-tongued and witty lyrics. Thematically what are your inspirations when sitting down and writing the lyrics? JH: I wanted to get as far away from the model of politics-as-t-shirt approach that A.D has as I could, so the basic idea behind the lyrics is to explore the relationship between political and sexual power, and cruelty – primarily within relationships. I like to filter these ideas through as much dark humour as I can too, so I can't think of any of our songs that shouldn't be delivered with a smirk or a sneer. IVM: You've already begun to build a strong live reputation. How important is this for you and ultimately what are your aspirations as a live unit? JH: I think it's important to have fun playing live and to make them as enjoyable and intense as we can. We can't do the jumping around and screaming that other acts do, but we can do noisy and slinky. And the songs are strong enough to stand on their own so that I can have a glass or two of Merlot during the set too. IVM: You have an EP and single to the Quasimodo name already. Are there plans for a full-length album any time soon? DF: I personally prefer the idea of EPs over albums these days… mainly because of the amount of time and investment it takes to bring out an album over the easier to pull together EP, less filler tunes and therefore time to concentrate on what we have rather than create or recycle music to plug the gaps. JH: As David says- I can't really see the point of an album as such at the moment. We tend to write in small bunches of songs and the idea of recording ten songs and having to go through the hassle of duplication and distribution doesn't appeal. Plus I've been through the hassle of contrived schedules with A.D and it was a mistake – Quasimodo has it's own metabolism, and shouldn't be rushed. Things happen when they happen. 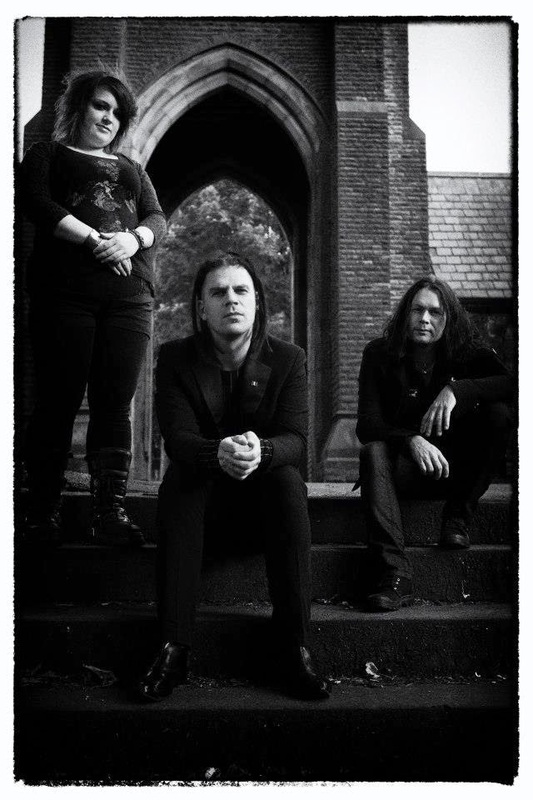 IVM: As a band proudly flying the gothic rock banner in 2014, what are your opinions on the state of the scene these days? JH: The funny thing is that although in objective terms the 'scene' is in a worse state than ever, personally speaking I'm actually having more fun with it now than I had before. The scene will survive and we do what we can either as band or as individuals to facilitate that. We're in a Leeds goth band and that's good enough for me! Emma Hedley: The Goth scene is very much undead for me and it always will be, I’m constantly meeting like minded lovely people and talented bands who are a joy to watch and share the stage with. It’s probably not what it used to be, we can mourn the past but also what we do now to support it is up to us what we make of it and it is important to keep it going with new nights and events and keeping the long established ones running. IVM: Since the breakup of Action Directe and Rome Burns and in addition to Quasimodo do any of you have any plans for further projects/releases releases or is Quasimodo your main concern now? DF: There has been talk in the past of a reunion gig with Rome Burns but time and life are the constant factors that are getting in the way of that. You never know if the opportunity presents itself and we manage to be all aligned in the right orbit then this may happen but it will not be any time soon. As it is I am currently involved with Simon Satori Hendley’s Hi-Reciprocity project which has more of a neo-folk bent to it and at present with some familiar Rome Burns tunes forming part of the repertoire building on the acoustic gigs we have done in the past. In time Simon seeks to have an eclectic array of musicians ducking in and out to aid him with his musical endeavours so it is very much a watch this space at this present time kinda thing which has the potential to be something a little different from the usual fare. JH: I like to keep a diverse musical portfolio, not just to keep myself busy but also to maintain as much musical integrity in each project as I can; I've learned from my time in A.D that having one project for all your songs is a big mistake if you have very diverse musical tastes. Apart from the 'Modo I'm keeping my hand in with Carpathian Love Gods and a few other new projects too. I don't think it's healthy to have a 'main concern' really – just do what you feel like when you feel like it. EH: I also play bass for Dawn of Elysium a Bradford Based Gothic Rock band, we are also gigging and we will be recording some new tracks and re-recording some older material later in the year and releasing a new EP. IVM: Finally, what are you plans for the rest of the year? JH: Live! Love! Sing! Drink! EH: More of the above, with sheer decadence! 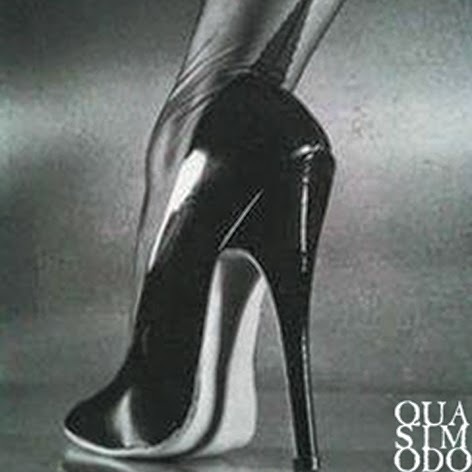 'Liberty, Equality, Atrocity' and 'Under The Whip' are currently available to buy from the Quasimodo bandcamp page. For more information on the band, including live dates and new releases, please visit their official website.